The Dog Care Clinic in Unwatuna helps saves the lives of thousands of Sri Lankan dogs every day. Read about our experience below, and how you can help..
“The greatness of a nation and its moral progress can be judged by the way in which its animals are treated.” “Mahatma Gandhi. In this sense, Sri Lankan has truly failed. 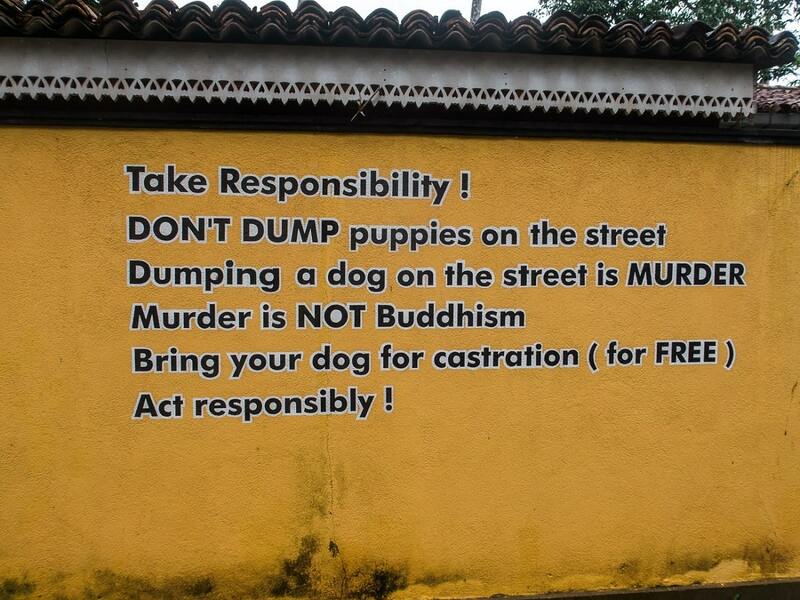 The dog situation in Sri Lanka is dire. With around 40 million stray dogs in the country, that’s a ratio of 2 dogs per person. Throughout our 4 weeks in Sri Lanka, we encountered many abandoned dogs and each time, leaving them came with a heavy heart. It would be impossible for us to save them all, so the only way Brad and I could help was ensuring we fed them when we found them. So we bought adult food and puppy food and fed all the dogs we saw. They all also got cuddles too, because every dog deserves love. The dog situation in Sri Lanka breaks my heart, and I couldn’t understand why there weren’t lots of organisations doing something about the situation. 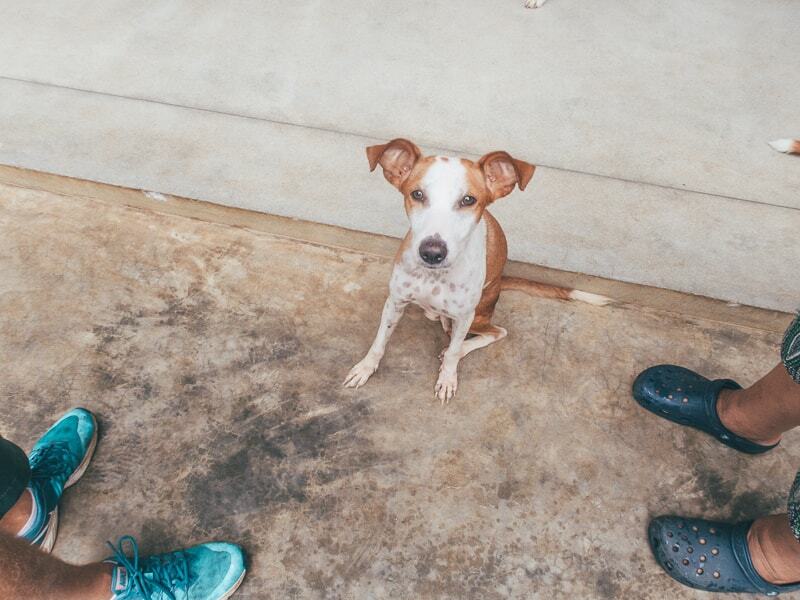 It wasn’t until we arrived in beautiful Unawatuna on the South coast that we found the ONE clinic actually doing their best to make a difference: The Dog Care Clinic in Unawatuna. As soon as we heard about the clinic, we knew we had to visit. Below I take you through our experience and how you can help the dogs in Sri Lanka from your very own home. 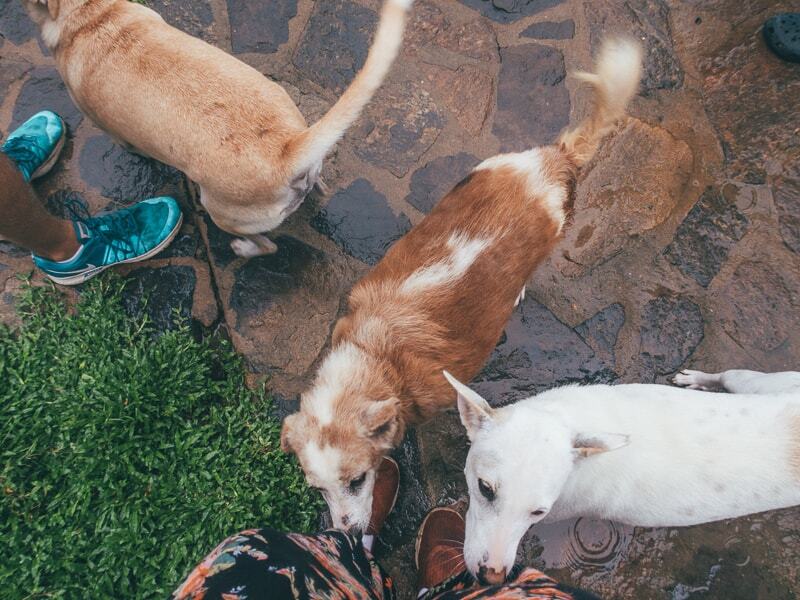 The Dog Care Clinic in Unawatuna is staffed by around 40 people and this comes in the form of people out and about finding dogs, feeding dogs, performing surgery on dogs, neutering dogs, or even just cuddling dogs. The staff head out every single day and night to feed over 400 dogs in the local area. They literally have piles and piles of food and these dogs know they are getting fed every night. Whilst they are doing their feeding routine, they can check and make sure all the dogs are in health and not injured. Every day they neuter 25 dogs a day. The fact they have been open since -- and are still doing 25 a day, shows the sheer amount of dogs in the area (and this is just one small part of Sri Lanka). Neutering is a core part of the program to help try and slow down the problem of dogs in Sri Lanka. There already isn’t enough homes, and more and more puppies are born and die because they are too ill to survive. Or they are dumped, beaten or sometimes gassed. Every day they also go on the lookout for abandoned and sick dogs. They drive around to find dogs, or they go in search of dogs that people have said are hurt or sick. This is particularly true in the village and jungle. In the villages, the people can’t afford to do anything with the dogs, so they simply leave them there to suffer. Lot’s of the time dogs are dumped outside the dog care clinic, or people bring dogs they’ve found around the country who are abandoned or sick. They’ve even had people bring dogs down from Jafna, which is the furthest point North in the country! Even those locals who do own a dog can’t afford to look after them truly. They can’t afford the medical bills if something goes wrong. But, this dog care clinic in Unawatuna covers all the cost, and all they ask in return from the locals are a small donation, whether it’s money or simply some bananas. 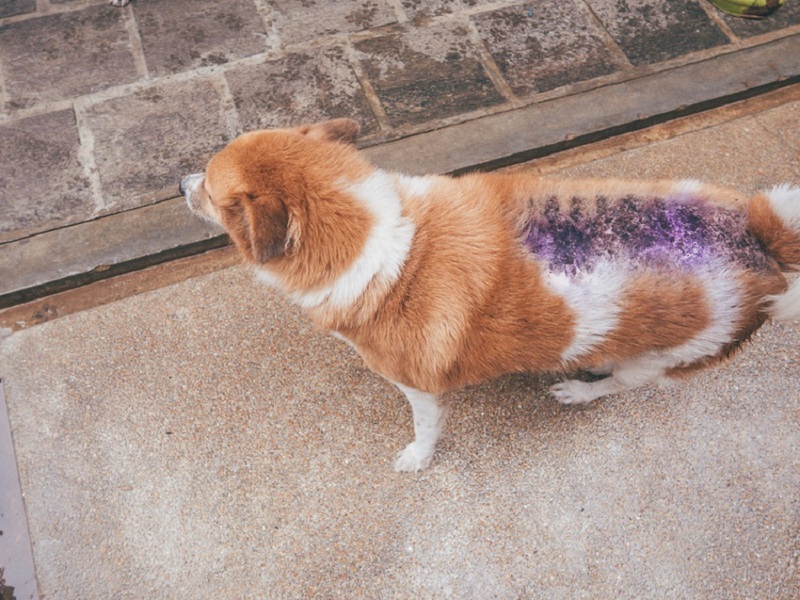 ‍They will NEVER leave a sick dog to die. As you can imagine this must cost a lot of money if they don’t take money from anyone, and you’re right. It costs tens of thousands a month and 80% of that is funded by one private donor- the amazing Marina Möbius. She started the project 10 yeras ago after seeing the situation of dogs in Sri Lanka, and she now works in Germany and sends the money to run this dog clinic and save these animals lives for free. I think that indicates the sort of amazing person she is. 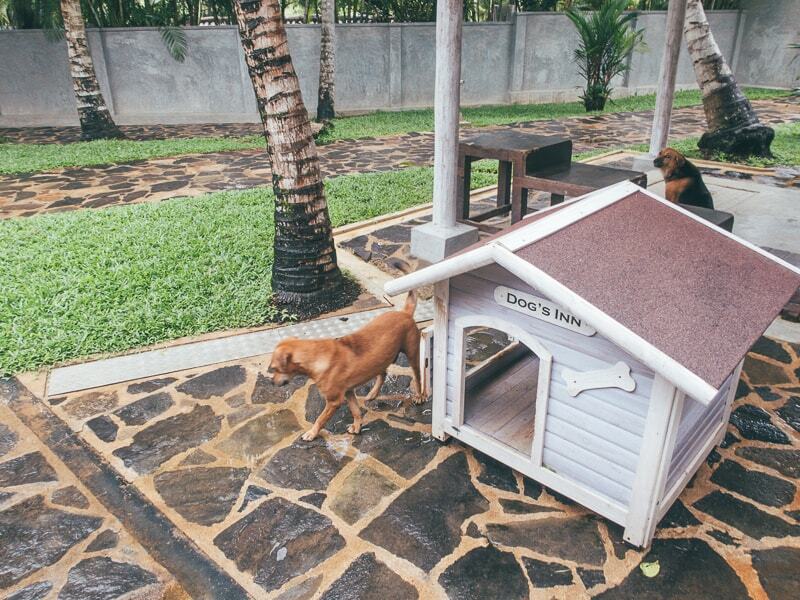 Ps, the dog care clinic in Unawatuna is also open 365 days a year, 24 hours a day. That is dedication. Upon entering the dog clinic we could already see dogs getting neutered, treated and post-surgery dogs just wakening up. We asked if we could have a tour of the area and learn more and they were more than happy to oblige. We got to meet lots of super friendly dogs who just wanted to play and cuddle. I felt like I was in heaven, surrounded by animals who just want love. We got to see lots of different puppies (always a treat), and we even got to meet some very unique dogs. We got to meet a dog with down syndrome, the most unique individual dog I have ever met in my life. He was charming and cute! We also got to meet a blind dog who also has a cleft lip. Another equally unique individual who was just so happy and sweet. We got to see the sad stories of how some of these animals ended up here, and how they were rescued and saved. It gave me great respect for the charity and I think what they are doing here is unbelievable. 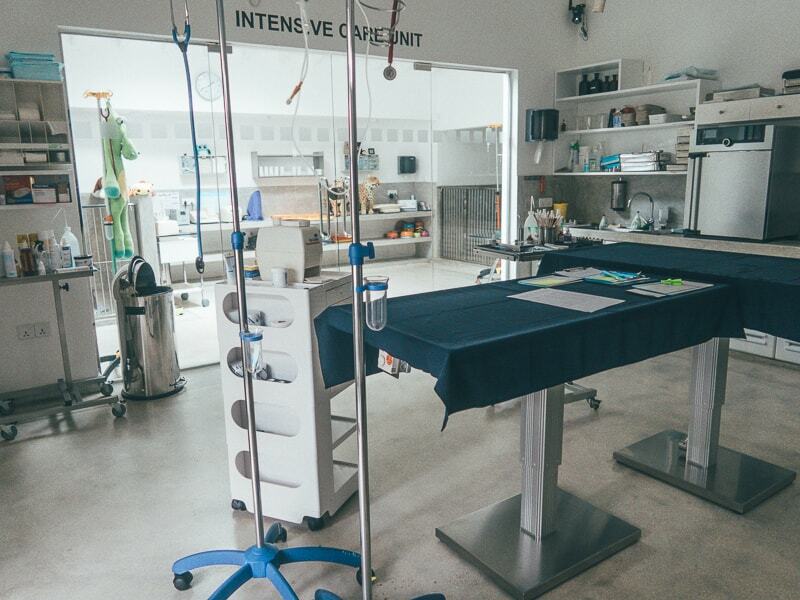 There is even an ICU unit for dogs who have had surgery and need to recover, and the whole place is clean, professional and safe for the dogs. Most of these dogs will never get home, but the dog care clinic does have an awesome scheme in place called the DCC +50. 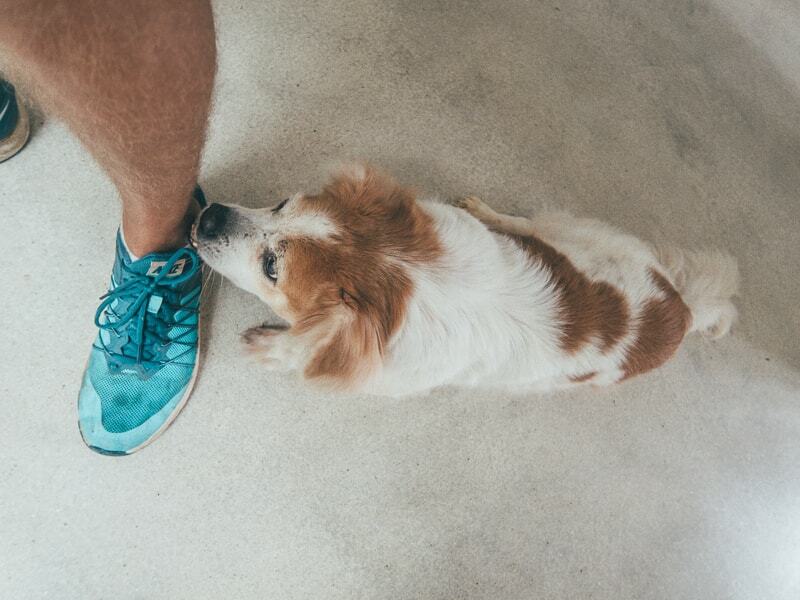 What this means is that for adults over 50, who are lonely and may need a fluffy companion, can take one of the dogs from the dog care clinic in Unawatuna and they will get paid to look after them monthly. The money given will be enough to cover food for the dog and the person looking after them. So it’s a good incentive in such a poverty-ridden country. They check on these dogs every single month to make sure they are being fed and looked after, and of course, loved. If they are, then the owners get paid to keep them for another month. Yay, you want to help, and you should if you have a heart. But thankfully there are LOTS of ways to help and donate, both in person and over the internet. You can volunteer: If your heart strings have been well and truly pulled, then you can head over to the dog clinic and complete an internship for 4 weeks for around 790 euro. This includes accommodation etc, and of course, go towards the dogs! Email info@dogcare-clinic.com. If you want to find out more about the internship. You can donate: You can donate in person via their little jar (that’s what we did), or you can donate online via credit/debit card or PayPal. This can be a one-off donation to your dog or a monthly payment. They even have a section of dogs dedicated to “in loving memory of”. I dare you to read through them and their little stories without crying- I really dare you. Take a doggy day tour: Do what we did. VISIT! See and hear for yourself how it all works. I promise you will be in awe of these people and what they have dedicated their lives too. Meet the wonderful dogs and leave a donation at the end. It’s an easy tuk-tuk ride away. And, if you can’t visit but want to donate, you can do so here. 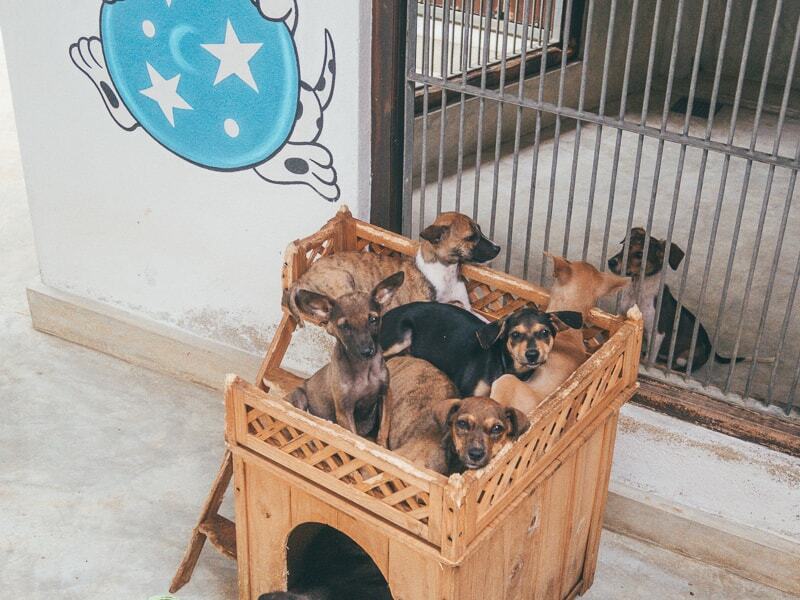 I hope you’ve enjoyed my post on the Dog Care Clinic in Unawatuna, and spread the word if you go so that more people can get involved and help the wonderful dogs of Sri Lanka. This is the only decent dog care clinic in Sri Lanka, so give it some love! 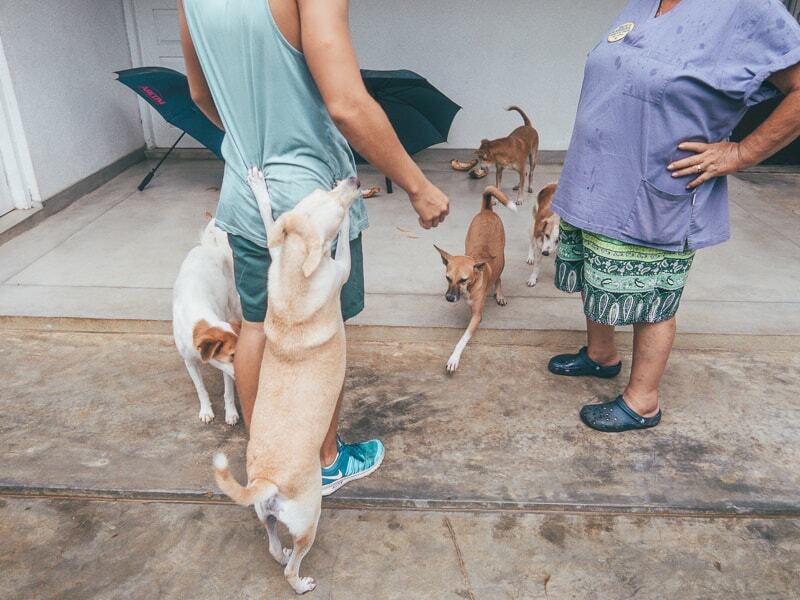 After you’ve shared the love with the dogs in Sri Lanka, you have plenty of other stuff to keep you busy in Unawatuna. Whether it’s surfing, swimming, lying on the beach, sipping cocktails by the sea, swinging on swings, or wandering around Galle Fort, you are spoiled for things to do in Unawatuna. Check out our full guide here!